Oh, yes. It’s that bad. Or that good, whichever way you choose to look at it. I was late to the Harry Potter craze. I didn’t read the books until 2010, and the only reason I did so was because I knew that Deathly Hallows Part 1 would be released in theaters soon. So, I thought, what the heck. I’ll pick up these kiddie books and see what the fuss is about. Oh.My.Goodness. Thanks to the fact that the kiddo was still taking three glorious naps a day, I was able to find myself completely captivated by this world that J. K. Rowling created. You often hear people referring to a book that was “life changing,” and I can honestly say that about this entire series. It pulls you into this magical world in which you find yourself laughing and crying along with characters that others claim don’t exist. But here’s the funny thing: they do. When you read, the characters exist in your heart. They exist in your mind for years to come. One of the things I love about these guys is that no one character in the series is wholly good or evil (aside from You-Know-Who, of course). That’s what makes them real. It’s what makes them exist. It’s what makes me root for them and scream at them and feel like I actually know them inside and out. So, thank you, Ms. Rowling. Thank you for giving us this world of magic that we’ll never forget. 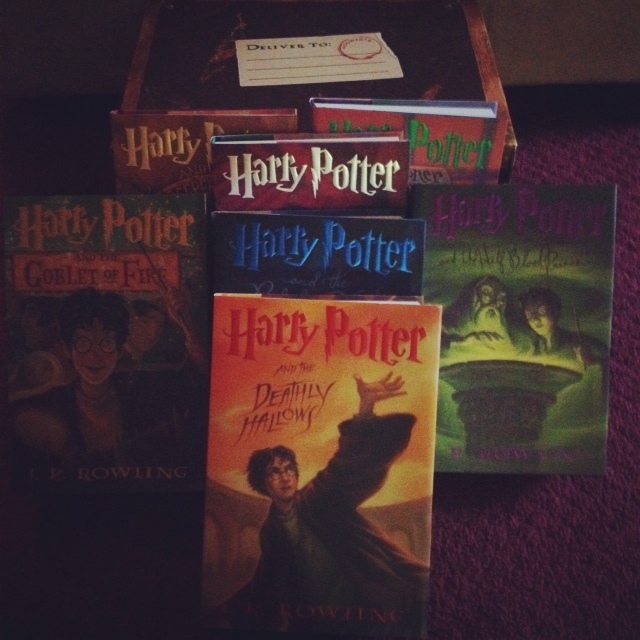 Thank you for giving us books to enjoy and re-read for years, and generations, to come.